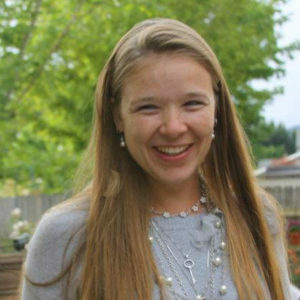 Thanks for joining us for our Get Kids Crafty September blog hop! 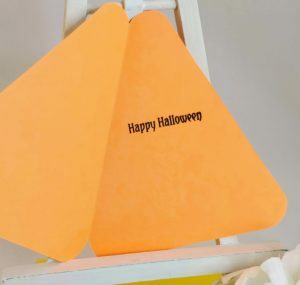 Today we’re getting a jump on Halloween with a fun card and treat topper. Kelly and I couldn’t wait to use the adorable new I Don’t Believe in Humans stamp set from Beth Duff Designs (this set will be released next week – lucky you, you get a sneak peek)! I decided to make a punny card and Kelly wanted to be sure to incorporate candy into her project, lol. 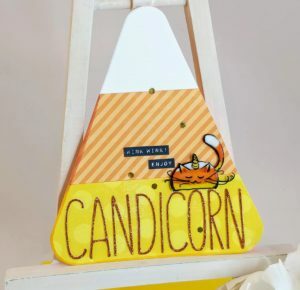 Kelly made this cute treat topper that staples onto a cello bag. She stamped, colored, and fussy cut her pugicorn image. She embossed her sentiment first with white embossing powder, then again with glow-in-the-dark embossing powder on a black cardstock strip. She cut and folded a black cardstock strip big enough to span her candy bag, then stapled it in place. She added a piece of pattern paper on front, making sure to hide her staples. She then glued the sentiment strip and fussy cut image in place. Cute and quick! She plans to make a few more to hand out to friends this Halloween. 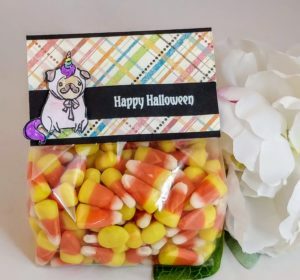 What do you get when you cross candy corn with a unicorn? Candicorn, of course! 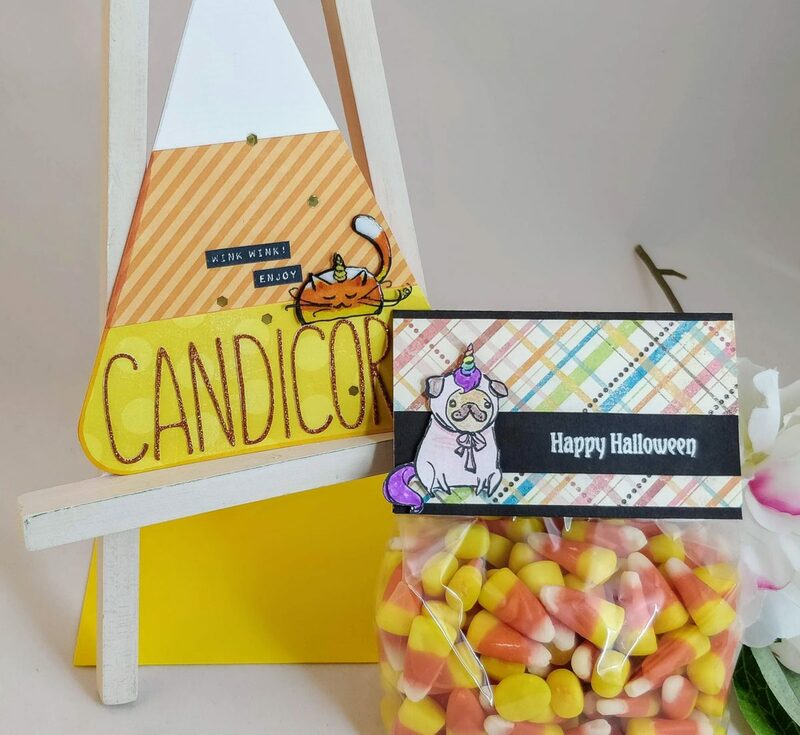 For my card, I thought it would be fun to color my caticorn in candy corn colors and place her on a fun shaped card. I cut an orange card base into a triangle and rounded the edges, then I added strips of pattern paper to the front and trimmed them to fit. Coordinating markers added a little shadow to the left edge and along the bottom, giving the card base a sense of depth. Inside the card, I stamped and embossed my sentiment. 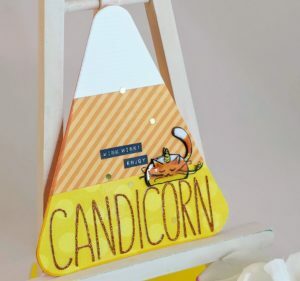 I used the Cutaway Alpha die set to cut out my candicorn sentiment several times from white scraps and once from orange glitter paper. By stacking the letters, you get a nice thick embellishment. I also stamped and embossed two small sentiment strips that say, “wink, wink” and “enjoy.” A ruler was helpful to line everything up and glue in place. I used foam tape to pop my caticorn up and embellished her horn with Wink of Stella then coated her with a layer of Glossy Accents. I scattered on a few gold confetti pieces to finish the card. I love how it turned out! Thanks again for stopping by. This month the Get Kids Crafty blog hop theme is Halloween so get on your broom and fly on over to each blog! The team and their kids have cooked up some amazing projects and we can’t wait for you to see them all. Be sure to click through all of the links in the hop. Once you’re done it’s your turn to get crafty with the young ones in your life! We can’t wait to see what you make. Tag us on instagram and use the hashtag #getkidscrafty or post in our Facebook group. We love seeing your creations! LOVE IT! The Caticorn is the best! LOVE, LOVE, LOVE!